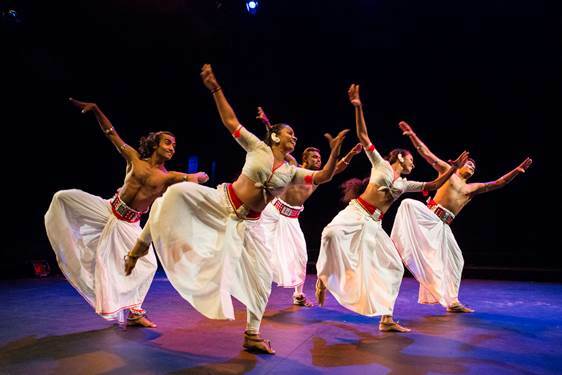 Dancing for the Gods, Chitrasena Dance Company for the Sydney Festival, January 8. IF there is a more immediately captivating dancer than Thaji Dias, I have yet to see her, or him. Dias is the leading dancer of Sri Lanka’s Chitrasena Dance Company, granddaughter of its founder and was clearly born to carry on his work. She isn’t the only reason to see the company but would be reason enough. On the opening night of Chitrasena’s short Sydney season Dias dazzled on every level: her technical command was exhilarating and her artistry ravishing, and if that were not enough Dias has megawatts of charisma. Chitrasena Dance Company was founded in the 1940s and has appeared in Australia twice, although not for 40 years. It’s a fair bet that unless they were from the local Sri Lankan community, audience members would have been seeing something entirely new, as was I. There are similarities with better-known classical subcontinental genres but the Kandyan style at the heart of Chitrasena’s work has its own character. It is an electric, powerful, dramatic form. Incredibly seductive, too. The gods to whom these dances pay homage didn’t shrink from sensual pleasures. While there are historical, ritualistic and devotional aspects to the dance, they have been adapted for the contemporary stage – not least in giving roles to women that were originally for men only. This is concert dance, the old forms interpreted and developed by Chitrasena’s artistic director and very fine choreographer, Hesma Wignaraja, also a granddaughter of the company’s founder. The group is not large – seven dancers; four drummers – and the production is modest. Nevertheless, it is rich in effect. Dancing for the Gods presents six dances in three sections (Ritual, Rites, Reflection) connected with aspects of worship and celebration, performed to intricate, robust, formidably blood-stirring drumming and chanting. An introduction featuring the Demon God (danced by Akila Palipana) shows him as a manically swirling being, the upper body swinging ecstatically in an increasingly fast and wide circle. A sinuous trio for men in honour of the Ganesha, God of Knowledge has a meditative quality and an intriguing trio for women arrestingly contrasts vivid poses with rapid sweeps around the stage. In this piece, Pantneru Matha, the dichotomies of love and war, past and future are evoked. Dias took part in this trio and in two solos of greatly different nature. The second had a contemporary feel despite its traditional vocabulary and was interior in quality. The dancer looked within herself. In the first solo, Dias reeled her audience in effortlessly with divinely articulated wrists, rippling shoulders, jaunty strides around the stage, the deepest and plushest plies and her warm, direct gaze. She is an artist of exceptional individuality whom Canberra audiences get the chance to see tomorrow. This review first appeared in The Australian.